What is “mouth guard”? 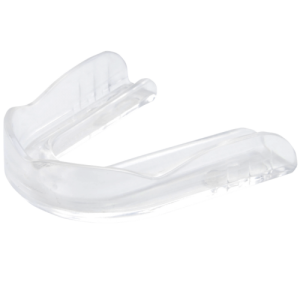 A mouth guard (Some people call it mouthguard, mouth protector or mouthpiece) is a flexible custom-fit device which you can wear them around your teeth and gums during recreational and athletic activities to save them from damage. A best-fitting mouth guard is extremely important if you wear dental braces, have set anterior bridgework or just want to save your smile/teeth from any future potential trauma. To prevent any unpredictable medical bills, wearing a safe mouth guard is definitely necessary. A mouth guard can work as a shock absorber for the teeth and gum, the brackets and/ or other fixed appliances from physical and absorbs contact. Mouth guards can also work as a barrier between braces/teeth and the cheeks, between the tongue and lips, thereby restricting the dangers of soft tissue damage. Stock mouth guards which can be purchased in drug stores and sporting goods, come pre-formed and ready to wear. Although they are the least costly, they are also the bad fitting and least protective or comfortable. Made of silicone or rubber or any other special materials, these pre-formed guards can be bulky to increase the tendency to gag, and also make breathing and talking difficult because they need the jaw to be closed to grip them to fit perfectly in the right place. Boil and Bite Mouth-formed Sport Mouth Guards can be either a boil-and-bite or shell liner kind. Boil and bite mouth guards are getting more popular nowaday. If you follow the instruction correctly, you can easily get a precise fit. The primary type is lined with rubber or acrylic gel that grips the teeth and sets to keep its shaped. The next type, produced of thermoplastic, is located in boiling water then made and molded to the forms of the teeth using lips, fingers, biting pressure and tongue. How to mold a boil and bite mouth guard this mouth protector can be reheated and refitted if the fit is not relaxed initially. Custom-fitted Mouth Guards are costly than the other types of mouth guards, but they give the amazing degree of comfort, fit, and protection because they are made from a cast to accurately fit your teeth. Your dentist builds an impression of your teeth and dental laboratory expert at an off-site dental laboratory or in the dentist’s office – uses the impression as a mold to make the custom-fitted mouth guard. Custom fitted mouth guards are made to cover all the teeth and cushion against blows and falls to the chin. Some custom built-in mouth protectors have strong outer layers and soft internal linings for relaxation against the gums and teeth. Some are produced of acrylic, as others are semi-rigid elastic and made stuffs for patients sensitive to acrylics. A dental guard is meant to save the teeth and gums from grinding and clenching during sleep. It is worn every time or night the patient sleeps, so it is made-up using a stuff that is not as thick but powerfully sufficient to serve its purpose. A sports mouth protector is a piece of equipment that is given to an athlete to save his teeth and gums from being injured from a physical blow to the face so they are normally used for contact sports. A sports mouth guard is generally made with thicker material to provide better protection, it is made to extend to cover the full jaw, and even the gum problems so that the gum tissue in the full mouth can be well protected.